Monday saw one of the most candid moments of Barack Obama's presidency, but it didn't come during his televised address. "I know some people want me to bypass Congress and change the laws on my own," the president said in an early-afternoon speech to the National Council of La Raza. "Believe me, the idea of doing things on my own is very tempting." Obama conceded that "that's not how our system works." 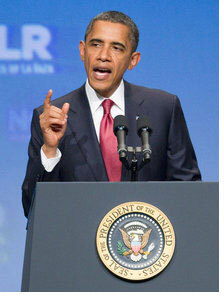 Eight hours later, addressing the nation on the debt and budget negotiations, he demonstrated the point. The president was reduced to imploring his viewers: "If you want a balanced approach to reducing the deficit, let your member of Congress know." A "balanced approach" means raising taxes--or, as House Speaker John Boehner pithily put it in his response to the president: "In Washington, [it] means we spend more, and you pay more." By all accounts, such an approach was already off the table. Democratic congressional leaders had agreed to cuts-only deficit reduction, though they wanted shallower spending reductions than the Republicans. So why did the president sing the same tired tune about raising taxes on "corporate jet owners" and "millionaires and billionaires," which he defines as those making over $200,000 a year? One can't rule out sheer stubbornness as a factor. Perhaps Obama still believes he was elected because of his magical persuasive skills, even though he hasn't persuaded the American people of anything since. But his approach of prolonging the crisis by refusing to yield for as long as possible makes a certain amount of political sense if we make the reasonable assumption that his overriding goal is not to get a favorable deal but to be re-elected. Obama's support has been sinking slowly this summer as the left has become disgruntled. A CNN poll last week gave him a 54 percent disapproval rating, tying an all-time high just before the 2010 elections. According to the network's polling director: "Thirty-eight percent say they disapprove because President Obama has been too liberal, but 13 percent say they disapprove of Obama because he has not been liberal enough--nearly double what it was in May, when the question was last asked, and the first time that number has hit double digits in Obama's presidency." Prominent liberals have been scathing in their criticism. "I am among those in a state of suppressed rage and panic over the president's negotiating strategy," former Enron adviser Paul Krugman wrote on the New York Times website Friday. "I hope I'm wrong about all this. But when has Obama given progressives any reason to believe they can trust him?" The same day, Sen. Bernie Sanders, the independent, self-styled socialist from Vermont, raised the idea of a primary challenge: "It would do this country a good deal of service if people started thinking about candidates out there to begin contrasting a progressive agenda as opposed to what Obama is doing." He added: "I think there are millions of Americans who are deeply disappointed with the president." He didn't mean the tea party. Obama can't win in 2012 if his left-wing base is demoralized, so it is imperative that he is seen as standing strong for their priorities. But make no mistake: If the Republicans do not yield, the president will have to. True, some polls suggest that the public is more predisposed to blame Republicans in the event that the crisis remains unresolved and turns into an economic disaster. It is nonetheless far-fetched to think that 15 months later, they would vote to re-elect the man who presided over a fiasco whose effects they would still be feeling. The December agreement to avert a tax increase probably portends the outcome here: Congress will arrive at a deal without tax increases, which the president will sign under protest. The left wasn't happy then, and it won't be now, but it would be far more enraged at a deal forged with Obama's active participation. It is difficult to see how the president can avoid emerging from this standoff in a weakened position. That's why he has been adamant that he will not sign a "short term" increase in the debt ceiling--i.e., one that will not last until the 2012 election. (On Monday, however, he praised Congress for raising the limit 18 times during Ronald Reagan's presidency.) One would be hard-pressed to describe his approach as a winning strategy. But one would be even more hard-pressed to come up with a less losing one.